Your Key to Proper Hydration. Promotes rapid absorption of important nutrients and energy. Quickly replenishes electrolytes in scouring and dehydrated goats, helping both kid and adult goats to restore their fluid balance. 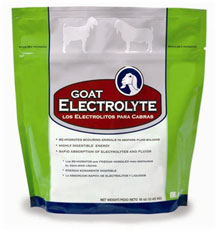 Provides dextrose for readily available energy in weak goats. Fortified with essential vitamins and minerals. Quick and effective.